Der Artikel Richard Strauss (1864-1949): Sämtliche Klavierlieder wurde in den Warenkorb gelegt. Ein weiteres groß angelegtes Projekt zum 150. Geburtstag von Richard Strauss ist beim südafrikanischen Label TWO PIANISTS entstanden: Unter der Ägide der Mezzo-Sopranistin und Strauss-Expertin Brigitte Fassbaender und 13 von ihr handverlesenen Sängern und Sängerinnen wurden im vergangenen November mit 179 Liedern und zwei Melodramen sämtliche Strauss-Werke für Gesang und Klavier eingespielt, darunter auch die Weltpremieren “Aus der Kindheit” und “Herbstabend,” TrV226. Diese als 9-CD-Box erscheinende Edition, die alle Werke in chronologischer Reihenfolge präsentiert, wird an Strauss‘ 150. Geburtstag, dem 11. Juni 2014, veröffentlicht und beim Richard-Strauss-Festival in Garmisch-Patenkirchen feierlich von Frau Fassbaender präsentiert werden. 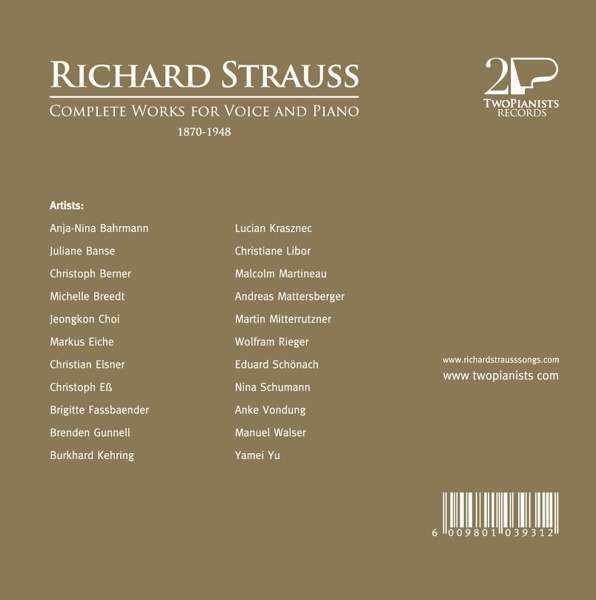 To celebrate the 150th birthday of Richard Strauss, TwoPianists Records is proud to introduce a new, authoritative, 9-disc set of the complete works for voice and piano by Strauss—a seminal collection that is set to become the reference standard for these vocal masterpieces, not least because of the inclusion of the first ever recordings of two Strauss songs: “Aus der Kindheit” and “Herbstabend,” TrV226. Under the artistic guidance of renowned mezzo-soprano, Strauss expert and stage director Brigitte Fassbaender, the project brings together 13 singers, handpicked by Fassbaender, to record the 179 extant songs and two melodramas that comprise Strauss’s oeuvre for voice and piano. Praised for their performances on the opera stage and in the concert hall, these German speaking singers, the majority of whom are notable Strauss interpreters, have more than done justice to the varying interpretive styles required by the songs. Presented in chronological order, the collection makes for a fascinating aural experience and listeners will be intrigued by Strauss’ musical development: from his first song, composed at the age of 6 with his mother’s help in writing in the text, to the final song, “Malven,” composed at the age of 84 during the last year of his life. A further distinguishing factor of the present recording is that every effort has been made to remain true to Strauss’ original intentions, with each song (in its original key) being matched to the correct voice type. Five distinguished pianists and three solo instrumentalists (violin, horn and trumpet), bring to life the thick orchestral textures of Strauss’ accompaniments, which comprise arguably some of the most fiendishly difficult piano writing in the late-Romantic song literature. 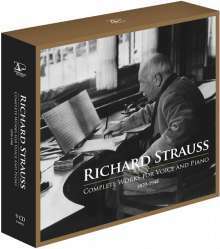 Strauss’ works for voice and piano exhibit the very best qualities that we have come to know from this composer: an innate gift for lyricism, a richness of harmonic colors and unmatched vocal allure. And yet, despite the popularity of a dozen or so of these songs, barely thirty of them, rather surprisingly, are regularly programmed in song recitals. This set therefore provides an invaluable source of authentic performances, captured in pristine sound and matched by scholarly musicianship – a noted contribution to Strauss’s recorded legacy that is sure to attract the attention of listeners, critics, performers and scholars worldwide.